The Frozen Flame Tour came through New York City on January 23 for the second show of a month and a half run throughout the country. Irving Plaza, a large yet somehow intimate venue, was the host of this show. Erra opened the night not long after doors as the floor was slowly filling up. The band brought a refreshing yet aggressive blend of metalcore to the show with impressive clean vocals and bone crushing lows. Although Erra had recently lost its vocalist and a guitarist, these guys performed their set without a hitch, and I'm sure they left a good impression on the many first-time listeners in the room. Fit for a King came to the stage next. Fresh off the October release of Slave to Nothing, this tour is set to be one of the band's biggest yet if this show was any indicator. Vocalist Ryan Kirby seemed to have control of the crowd like a puppet throughout the set, while the rest of the four piece refused to stay still on stage, bringing a constant energy that the crowd seemed to mimic. Fit for a King obviously drew out many fans to this tour, but I am sure the band will make just as many – if not more – before it's over. Northlane was the set I was most concerned about going into this show. The band recently had a major vocalist change that was a long and drawn-out process, and I wasn't sure if the new vocalist would translate well or if the hype would still be there. That being said, it seems as if Northlane has not lost any momentum at all. Marcus Bridge, the new vocalist, has an amazing range one could argue surpasses the previous vocalist in a live setting. Instrumentally, the band has always been on point and continues to be. The energy was ambient at points and super heavy at others, which made for a roller coaster of a set for the fans. With an even better live sound and a fan base that is still packing venues, I expect Northlane to make some big moves in 2015. Miss May I was a band I had personally forgot about for a while. After seeing these guys on the bill, I was surprised they were as high up as they were. 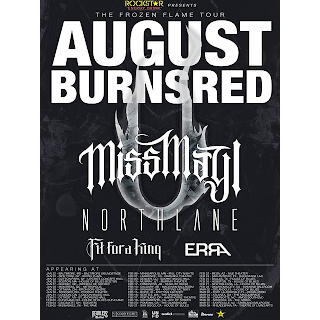 Apparently, while I was sleeping on this band, a lot of kids got into Miss May I – and I mean a lot. The crowd erupted as the band opened with "Hey Mister" and metal horns were flying all over the venue. Miss May I played a solid amount of old songs I was able to recognize, such as my favourite, "Tides." The band's live sound was just as big as any big venue headliner and vocalist Levi Benton (who ultimately had the best hair in the room) had some of the best stage command of the night. August Burns Red finished off the night by playing an hour-long-plus set featuring old and new songs. 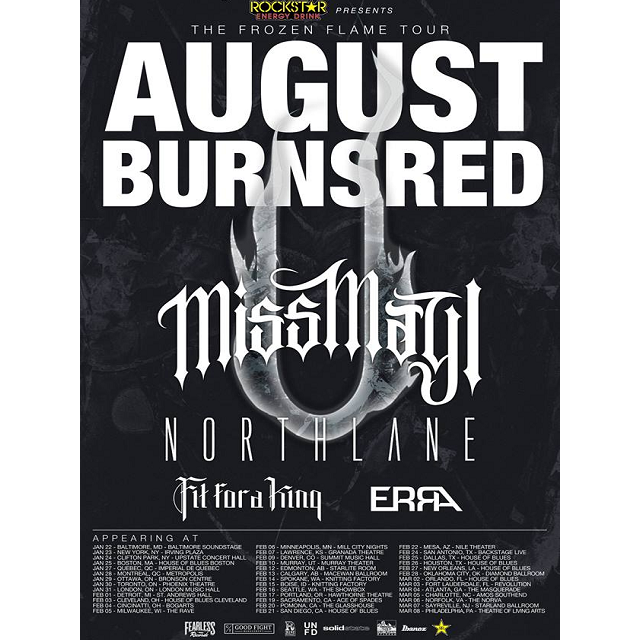 Reaching the end of the most recent album cycle, August Burns Red still had enough hype to sell out this show and I'm sure many more on the tour. The members makes their extremely technical songs seem easy when they play, and you can tell everyone in the band has a lot of fun on stage. Jake Luhrs is one of the most intense vocalists and frontmen in the scene and Matt Greiner arguably IS the best drummer. One thing I loved about the set was the focus on percussion throughout, especially in the beginning and at the end where the band organized a very special feature. I can't spoil it for you, so I suggest going out to these shows to see it for yourself. Check out some photos from the fun night below.